Ticking this option will allow you to enable Two-Factor Authentication of your own accord via the client area. 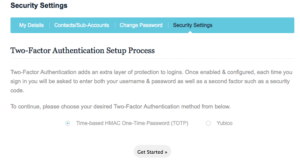 Once activated you will need to complete two-factor authentication each time you login. Activate it from Clientarea through the My Details page, located under the “Security Settings” simply click the Click here to enable button beneath the “Two-Factor Authentication” heading and follow the on-screen instructions. Time Based One-Time passwords requires downloading an OATH application onto your smartphone or tablet, and optionally a bar-code reader. Once activated a pop-up screen will present a QR code, with optional manual code to enter into your smartphone or tablet. Once scanned or entered, a time based one time password will appear within your OATH application providing the second form of verification used to log in. YubiKey creates a one time password stored within a USB drive that acts as a keyboard to your computer. These are physical devices that need to be purchased from Yubico directly. You Should decide to disable two-factor authentication at a later date, they can simply click the Click here to disable button which will appear in the same location. How do I forward my domain name to another URL? How to Clear your DNS cache?